Hearing is one of the five senses. It is a complex process of picking up sound and attaching meaning to it. The ability to hear is critical to understanding the world around us. Hearing is one of the major senses and like vision, it is important for distant warning and communication. It can be also used to alert, to communicate pleasure and fear. It is a conscious appreciation of vibration perceived as sound. The human ear is a fully developed part of our bodies at birth and responds to sounds that are very faint as well as sounds that are very loud. Even before birth, infants respond to sound. Air-conducted sound waves move through these three parts of ear in order for sound to be heard. The outer ear serves to channel the sound waves into the middle ear which is composed of three bones. These three bones mechanically transmit these waves to the oval window, which is part of the inner ear. The oval window vibrates inwardly, creating pressure waves in an incompressible fluid which fills the inner ear. This fluid pressure excites the membranes in the cochlea, a section of the inner ear shaped like a snail shell which contains the basilar membrane. The basilar membrane has tiny hair cells which transform the mechanical motion of the pressure waves into nerve impulses. These impulses are then transmitted to the brain where they are decoded and interpreted as sound. Movement of the fluid in the inner ear, or cochlea, causes changes in tiny structures called hair cells. This movement of the hair cells sends electric signals from the inner ear up the auditory nerve to the brain. The pinna is the visible part of the ear that resides outside of the head. We often use the pinna, also called the auricle, for hanging earrings and resting eyeglasses, but the primary purpose of the pinna is to collect sound. It does so by acting as a funnel, amplifying the sound and directing it to the ear canal. While passing through the pinna, sound also goes through a filtering process in which sounds in the frequency range where human speech is normally found are enhanced. Finally, the filtering process also adds directional information to thesound. The auditory canal has two main functions: it provides a passageway for sound travelling from the pinna to the eardrum, and it protects the ear from infection. On average, the canal is 3.5 cm long and .7 cm wide. In order to protect the ear, the auditory canal has several lines of defence. The part of the tube closest to the pinna is full of nerve endings and is covered with soft, sensitive skin. Old skin is pushed out when new skin grows, naturally cleaning the ear canal. Further in, the canal contains small hairs that filter out debris. The final line of defence protecting the ear is a group of wax fibbers called cerumen strands. These strands are electro statically charged, allowing them to catch small dust particles. Ø The pinna “collects” the sound waves from all directions and directs them into the ear canal. Ø It also makes the higher frequency sounds (i.e. 5000 Hz to 7000 Hz) a little louder by “resonating” them. Ø The ear canal helps in smooth transmission of sound waves from the pinna to the eardrum. Ø It also amplifies & makes certain frequencies (around 2000 Hz) sound louder by its natural resonance. Ø Because of its `S’ shape, the ear canal protects the eardrum from direct injuries from sharp objects. Ø The hair & wax present in the ear canal protect the eardrum & other delicate structures in the middle ear by preventing the entry of any foreign body such as insects, worms, dust, etc. The eardrum plays a key role in hearing. Another word for eardrum is tympanic membrane. The TM forms the outer wall of the middle ear cavity. It is a very thin membrane with a thickness of app. 1/10th mm. It has an area of about 85 to 90 sq mm, at about 1 cm in diameter. The normal TM is pinkish in colour, roundish oval & concave in shape. The membrane is held in place by a thick ring of cartilage. The tympanic membrane is comprised of three layers of tissue: the outer layer, the fibrous middle layer, and a layer of mucous membrane on the innermost surface. The layer closest to the auditory canal is composed of skin; the next layer is of a fibrous and elastic material; the final layer is a mucus producing lining. The annulus, a fibro cartilaginous (made of a special type of cartilage) ring, holds the eardrum in place. The eardrum is very thin and translucent. The tympanic membrane's function is to assist in human hearing. When sound waves enter the ear, they strike the tympanic membrane. The membrane vibrates with the force of the sound wave strike and transmits the vibrations further into bones of the inner ear. Patients with ruptured or missing tympanic membranes have extreme difficulty in hearing. The three bones named the malleus, incus, and stapes. Commonly referred as the hammer, anvil, and stirrup. The auditory ossicles consist of three small bones found within a space (the tympanic cavity) in the temporal bone of the skull. The bones (which are named for their shape) are connected by synovial joints. 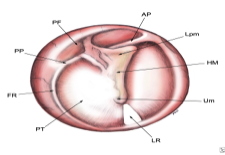 Resting against the oval window of inner ear is the stapes (stirrup), which articulates with the middle ossicle called the incus (anvil). The incus articulates with the malleus (hammer), whose "handle" is attached to the internal surface of the tympanic membrane (eardrum). Sound-induced vibrations of the tympanic membrane are thereby amplified and transmitted through these ossicles to the inner ear where they are interpreted as sound. synapses ending in the facial nerve. Since the reflex arc is very small the reaction time is also pretty short i.e. 6-7 milliseconds. Both these muscles are known to contract in response to non acoustic stimuli also i.e. stimulation of cornea by puff of cold air, vocalisation, touching the skin around the eye etc. The Eustachian tube is a canal which connects the middle ear to the nasopharynx, which consists of the upper throat and the back of the nasal cavity. It regulates the pressure within the middle ear, equalizing it with the air pressure outside the body. Most of the time the Eustachian tube is closed, opening only during activities such as yawning, swallowing, and chewing, to allow air through the passage between the middle ear and nasopharynx. When atmospheric pressure changes rapidly, causing a sudden feeling of blockage in the ear, these activities can be done deliberately to open the tube and equalize the pressure within the middle ear. The oval window (or vestibular window) is a membrane-covered opening which leads from the middle ear to the vestibule of the inner ear. 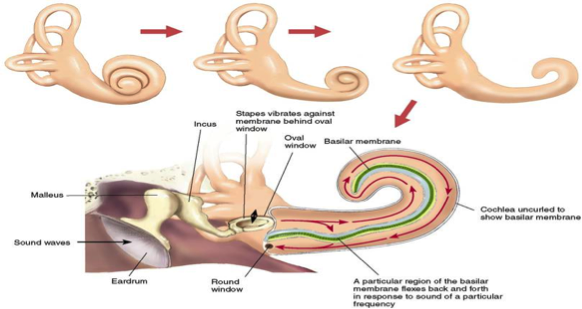 Vibrations that come into contact with the tympanic membrane travel through the three ossicles and into the inner ear. The oval window is the intersection of the middle ear with the inner ear, and is directly contacted by the stapes; by the time vibrations reach the oval window, they have been amplified over twenty times from what they were when they contacted the tympanic membrane, a testament to the amplifying power of the middleear. Ø The middle ear conducts the sound from outer ear to the inner ear. Ø It acts as a “Transformer” whereby it conserves and enhances the sound energy so that not much energy is lost due to impedance mismatch while transmitting the sound from air medium of M.E. to fluid medium of I.E. Ø The transformer action of the M.E. enhances the sound energy approximately up to 27 dB. 2. the contraction of the stapedius and tensor tympani muscles protects the delicate structures in the inner ear from damage due to very loud sounds. 1. Protection of inner ear from damage due to excess noise. Although the reflex may be pretty slow in protecting the inner ear against sudden noise, it could serve this purpose with longer lasting noise exposures. In fact it has been demonstrated by Zakrisson that patients with Bell's palsy and paralysis of stapedius muscle have a greater incidence of temporary threshold shift when compared with normalcontrols. Inner ear is also known as internal ear. It is also referred to as Bony Labyrinth as it consists of a set of complicated tubes in it. It is as small in size as a “pea”. It is also called as vestibule as it is a passage to the other portions of the auditory system and brain. Both the organs of hearing as well as the organ of the balance are housed/situated in the inner ear. The inner ear structure called the cochlea is a snail-shell like structure divided into three fluid-filled parts. Two are canals for the transmission of pressure and in the third is the sensitive organ of Corti, which detects pressure impulses and responds with electrical impulses which travel along the auditory nerve to the brain. It is made up of a twisting bony shell, which is about 1 cc wide and 5.mm. broad from base to apex. Thus the basal end of the cochlea (which is towards the middle ear) is broader while the apex is pointed. Inside along this bony coil, there is a membranous tube. The cochlea is the sense organ that translates sound into nerve impulses to be sent to the brain. Each person has two cochleas, one for each ear. The cochlea is a fluid-filled, snail shaped cavern in the mastoid bone of your skull behind each ear. Tiny bones in the middle ear transmit sound from the eardrum across the middle ear and vibrate against the cochlea. Vibrations in the fluid cause tiny hair cells in the fluid inside the cochlea to vibrate and generate nerve impulses that then travel to the brain. Taking electrical impulses from the cochlea and the semicircular canals, the auditory nerve makes connections with both auditory areas of the brain.